Always Crafting: I'm nuts about you! Here's my second entry for the Whimsie Doodles Challenge Tag You're it! 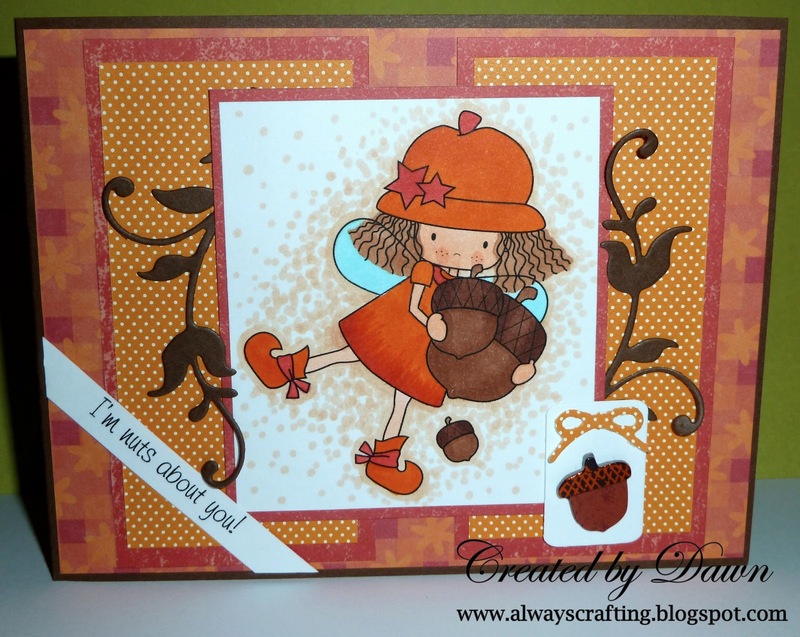 I just love this image from Whimsie Doodles. Well... ALL the images from Whimsie Doodles to be honest. She is such an adorable fall fairy! I don't think there are enough cute fall images out there and this is the first fall fairy image I have seen. Love it! You can find her here! Of course, I pulled out my great K & Company papers (happy trails) for this card. The tag on this card is just the little tag with the acorn on it... sweet! Whimsie Doodles - Tag You're it! Love it! And I have to agree, she is the cutest Fall Fairy out there. Love the little acorn in the corner and the sentiment on an angle. Very cute!! So glad you could join us on Whimsie Doodles! Another cutie!!! The mat you colored looks so good - really puts the focus on the image! Thanks for joining in the fun (again)!!! Oh, love this one so much Dawn! If that is so you're one of the sweetest nuts I know! Great work Dawn. Dawn, love the coloring of the Whimsie Doodles image, especially how you did the dotted shading around her. Thanks for playing along with us again this month and good luck on the guest artist spot. Lovely card Dawn, such a cute image. Again - ADORABLE! Love your coloring! I'm so glad you were able to play twice this month! Thanks for playing along with us at Whimsie Doodles! Hambo Challenge - You've been framed!